Forever spring – For the fainthearted . . . The August bank holiday in England seemed always to mark a psychological end to the summer, a last “hurrah” before the reality of shortening days and cooler weather had to be contemplated. For a schoolboy, it was a moment of gloom. The summer had meant life outdoors, it had meant football and fishing, it had meant cycling the roads and scrambling bicycles over rough ground, it had meant being with friends and sharing laughter each day. Autumn meant schooldays, it meant little opportunity for the pastimes that had filled the weeks of the long holidays. It meant being indoors and being isolated from the company of those whose presence had brought the happiness of the long days. Those days are long past, the advent of social media has meant that physical isolation does not mean one is prevented from constant social interaction with one’s friends. Social media have become such a dominant element in people’s lives that even on summer days there are those who prefer the screens of their smartphones or tablets to the physicality of footballs or bicycles. Yet no amount of Facebooking, nor Snapchatting, nor messaging can change external realities; as the old preachers of former times would declare, the summer is past and the harvest is ended. It is the task of marketing executives to know how people are thinking; retail sales are not a matter of chance, they are a matter of careful research and planning. Advertising is not the scatter gun activity that it sometimes seems, nor are supermarket promotions an arbitrary matter: the financial stakes are far too high for random and unplanned activity. 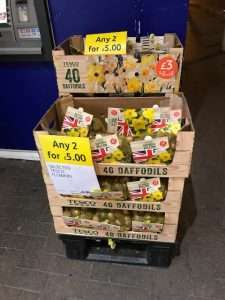 When, on 24th August, Tesco have daffodil bulbs on sale at a special offer price at the doorway of a store, they know that the display will find a resonance with those who come to shop at the supermarket. 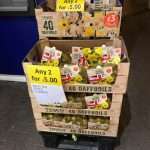 Daffodil bulbs on the eve of the bank holiday weekend are a recognition that many people would happily leap from the end of summer to the beginning of spring, that dark and wet coldness have not the attraction of warmth and daylight. No flower is more striking than the daffodil as a declaration of the prospect of spring days; its presence is a bright assurance of light and heat. Tesco’s offer of eighty bulbs for £5 seems great value, barely more than six pence for each bulb. Eighty bulbs would create a great splash of gold. 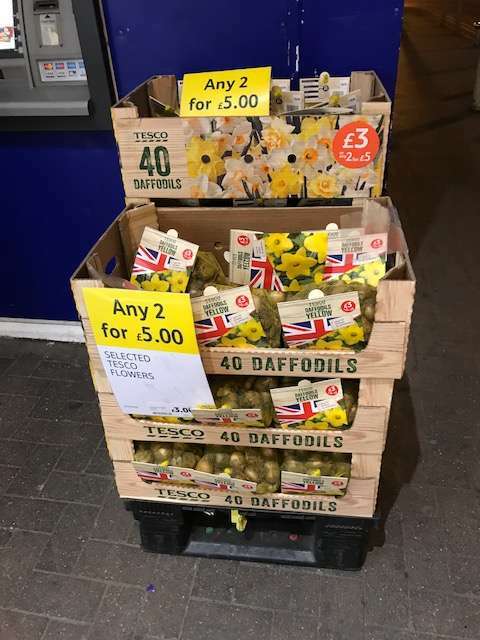 Tesco understand our wish for golden days.